The attorney for the Rines says that the attempt to remove the contaminated soil to mix with materials to use in the repair of a slip is simply an excuse to haul away the waste and cover up what was dumped in the pit. ”These cases are common sense and common law,” said Brian Glasser, a Charleston lawyer who represents the Rines and and has filed two other similar cases against Chesapeake. ”You can’t bury a bunch of waste in someone’s yard. It’s that simple.” The grounds for the suit is that dumping and burying waste is not “reasonably necessary” – the legal test for activities allowed by state natural gas laws. 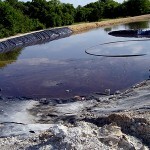 Public health and environmental groups campaigned during the past legislative session for the use of closed loop systems to eliminate the holding pit system. 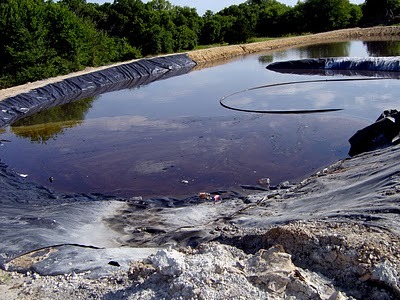 Groundwater contamination has occurred in the vicinity of drilling waste pits pits. There is also concern regarding air pollution from volatile organic compounds in the waste fluids. As a compromise position, groups demanded that law be enacted to require the use of a reinforced liner system and proper disposal of pit liners. 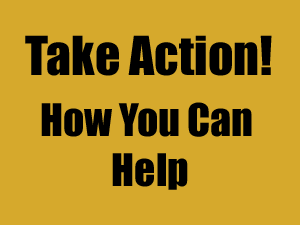 No protective legislation was passed during the 2011 legislative session. Way to go WV! Texas has some very recent cases of water wells contaminated from burying pits.